Winger JP Pietersen ran in a hat-trick of tries as South Africa recovered from their shock World Cup defeat by Japan with a routine bonus-point victory over Samoa at Villa Park. Michael Stanley's two early penalties gave the Samoans a 6-3 lead. But Pietersen's first try, and four Handre Pollard penalties, meant the Springboks led 17-6 at the break. Pietersen added two more tries, with Schalk Burger, Schalk Brits and Bryan Habana completing the Pool B rout. Pollard was successful with only one of his four conversions, the other coming from his late replacement Pat Lambie, but his side ran out comfortable winners. Samoa got the biggest cheer of the day when they thought they had crossed the South Africa line on the hour mark, but Tusi Pisi's try was disallowed for an obvious forward pass. The first of South Africa's three tries was the most dramatic as Stanley's attempted looping pass was cut out by Pietersen, who galloped from 10 metres inside his own half to score. The winger made no attempt to beat the last covering man and get round under the posts - and Pollard missed the conversion. Six minutes after the break Pietersen crossed again, strolling into the corner with Samoa's defence sucked inside. The Springboks scored again 11 minutes later, when Burger stretched out his right arm to snake the ball across the line. Brits scored two minutes after coming on, before Pietersen crossed for a third time. There was still time for a sixth try with the game's final play - Habana racing half the length of the field to seal the victory. South Africa went into this game with a huge cloud hanging over them following that last-gasp defeat in their opening game against Japan. But only briefly did it look like there might be another shock on the cards when Stanley's second penalty sailed over from the halfway line to give the Samoans a 6-3 lead. Once Pietersen had run in the second of his three tries to help open up an 18-point lead, it was all over. And, before 15 minutes had elapsed in the second half, the crowd launched into a Mexican wave... the ultimate death knell of any genuine sporting contest. 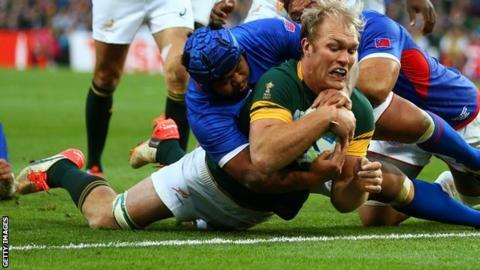 Schalk Burger - He made comfortably more carries than any other player in the match and his efforts were rewarded with his 15th international try, before being allowed a well-earned rest 12 minutes from the end. Wayne Barnes - Never backwards in coming forwards when it comes to awarding penalties. He had a big decision to make approaching half-time following a neck-high Pietersen challenge, but it was clearly aimed at shoulder, not neck, so the referee got it spot on. Bizarrely, he was booed in the second half for chalking off the blatant forward pass (from Tim Nanai-Williams to Kahn Fotuali'i) that led to Pisi's try. Or maybe the discerning home crowd simply didn't think he looks good in pink. The Springboks were facing Samoa for the fifth time in the World Cup; they have not faced any other side on more than four occasions in the competition. Vavae Tuilagi became the fifth Tuilagi brother to play at the World Cup; his brothers Freddie, Henry and Alesana have all featured for Samoa in the tournament while Manu played for England in 2011. South Africa have won all five of the World Cup clashes between the two sides, scoring 29 tries. Pietersen's hat-trick was the fourth instance of a Springbok scoring three or more tries in a World Cup game; three of those against Samoa, with Chester Williams and Habana each scoring four in 1995 and 2007 respectively. South Africa: Willie le Roux, JP Pietersen, Jean de Villiers (captain), Damian De Allende, Bryan Habana, Handre Pollard, Fourie du Preez, Duane Vermeulen, Schalk Burger, Francois Louw, Victor Matfield, Eben Etzebeth, Jannie du Plessis, Adriaan Strauss, Tendai Mtawarira. Replacements: Schalk Brits, Trevor Nyakane, Frans Malherbe, Lood de Jager, Siya Kolisi, Ruan Pienaar, Pat Labie, Jesse Kriel. Replacements: Ole Avei, Viliamu Afatia, Census Johnston, Faifili Levave, Vavae Tuilagi, Vavao Afemai, Tusi Pisi, George Pisi.